Lightweight and handy Pipe Saw 170 battery is now available also in battery version. 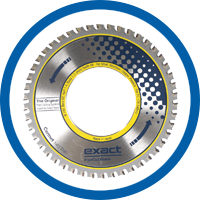 You cannot find an easier, faster and safer way for cord- less pipe cutting. The powerful 18V/4.0 Ah battery enables cutting of steel, stainless steel as well as copper and plastic pipes in any place at any time, efficently. The range of use is the same as with the AC powered model (15 mm –170 mm / 0.6“ - 6.7“).